Terrel Higdon Yon was born on October 18, 1820 in Laurens Co., Georgia and died on January 21, 1864 in Calhoun Co., Florida. He lived to be 43 years old. Silas Higdon Yon (10/25/1864 -11/1/1904) Shiloh. After Terrel died, Elizabeth married William B. Clark. 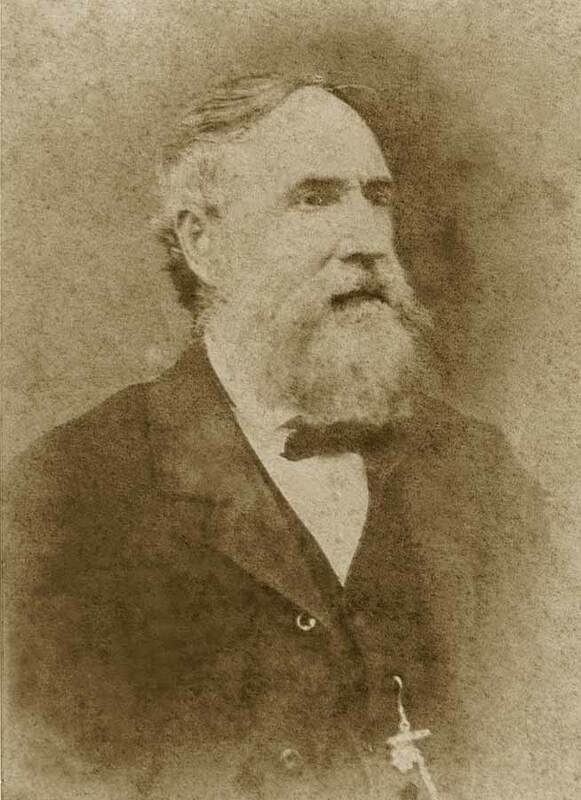 In 1852 he was appointed Justice of the Peace, Probate in Calhoun County, for a period of two years at Abe Springs Bluff Court and reelected in 1863. He enlisted at Camp Jehu with Captain Thigpen and served as a Private in Company E., 5th Battalion, Florida Cavalry. He was discharged on 11/30/1863. He was a Corporal in the Second Seminole War under Captain Scott's Co., 5th Regiment, Florida Mounted Militia Enlisted at Fort Yates, Gadsden County, Florida for a period of 3 months. . 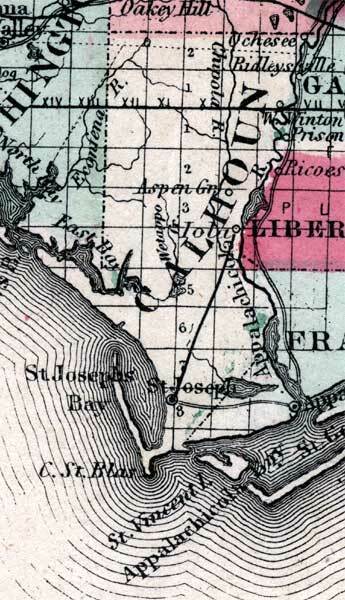 He purchased property (between 1846 and 1854) 1338.3 acres of land from the federal government. 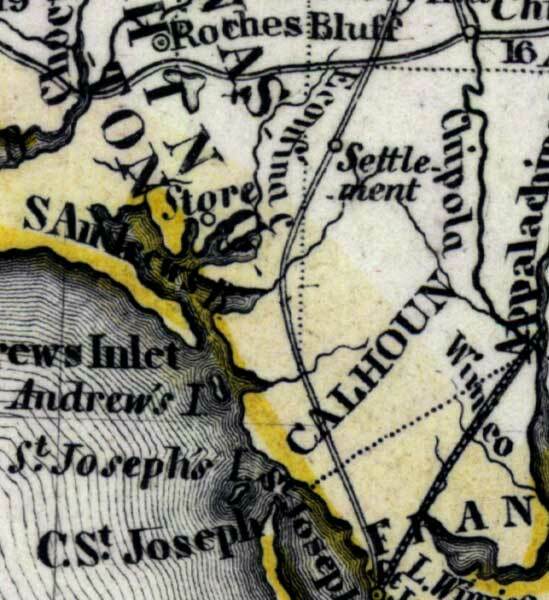 Most of it located along the west banks of the Apalachicola River. 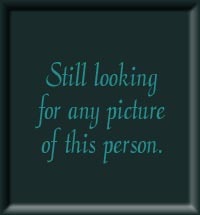 family# 128: Terrel H. Yon (age 30)GA & M. B. Stone (age18)FL. estate value $6000. $860 dollars owned to Terrel Yon. NOTE: Click link below to view 5.22 MB PDF copy of this document. the will of Jesse Yon. Wife Martha listed, along with names of Jesse's children. Private Terrel Yon - Enlistment Date: Aug. 15, 1863, Rank at enlistment: Private, Enlistment Place: John's Landing, FL, State Served: Florida, Service Record: Enlisted in Company A, Florida 2nd Cavalry Regiment on Aug.15 1863. Mustered out on Sept.15,1863. Transferred to Company E, Florida 5th Cavalry Battalion on Sept. 15, 1863. Mustered out on Dec. 1, 1863. Click on any of the News, Events, or Discoveries buttons above to see historical things that happened during Terrel Yon's life. These are only some of the major events that affected the life and times of Terrel, his family, and friends. For example, Terrel is 10 years old when Indian Removal Act signed and the moving of eastern Indians west of the Mississippi begins. Born on October 26, 1835 and died on May 28, 1906. 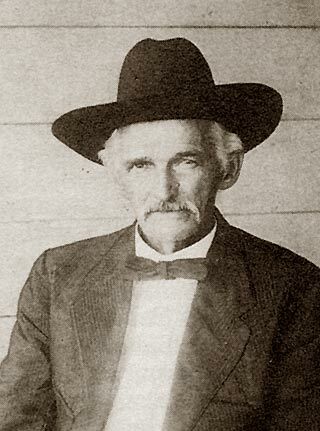 Born in Calhoun Co., Florida on August 25, 1856 and died in Calhoun Co., Florida on June 5, 1930. He was 73 years old. 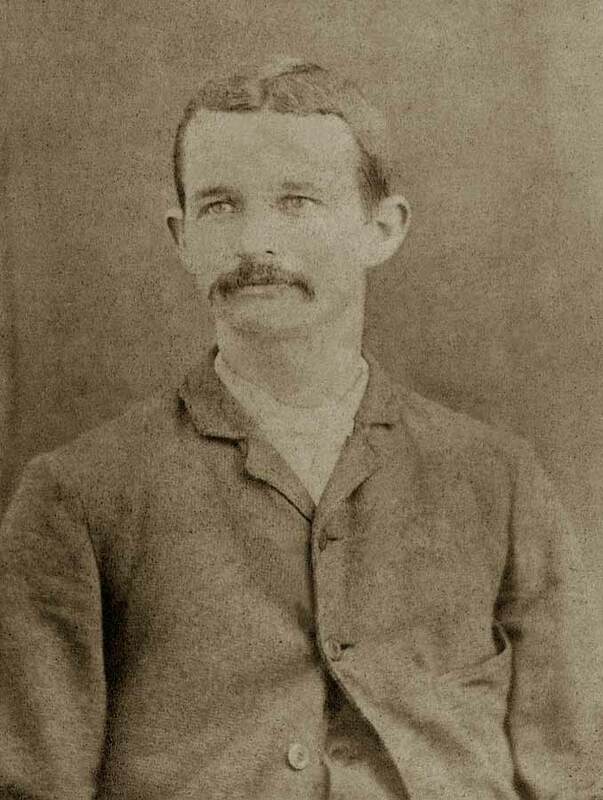 Born in Calhoun Co., Florida on May 31, 1858 and died somewhere in Florida on December 6, 1936. He was 78 years old. 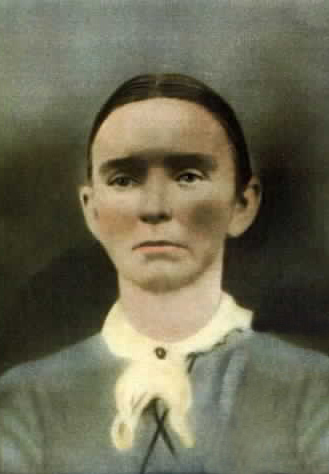 Born in Calhoun Co., Florida on October 25, 1860 and died somewhere in Florida on May 1, 1905. He was 44 years old. Martha T. Dickens(4/1873 - ).